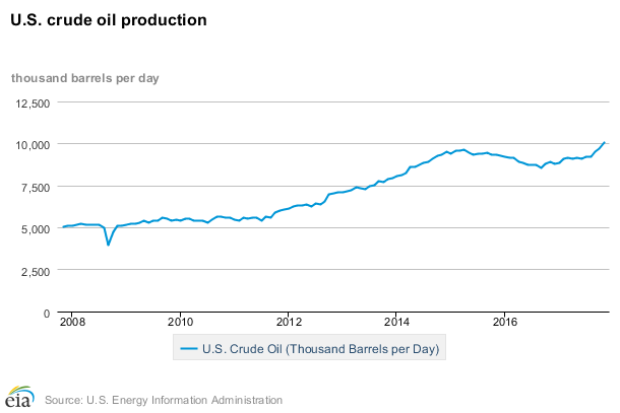 U.S. oil production hit a historic milestone, pulling more than 10 million barrels per day out of the ground last November, according to the latest federal data. The U.S. Energy Information Administration reported Wednesday that crude production hit 10.038 million barrels per day, nearly beating the all-time record of 10.044 million barrels per day hit in November 1970. It’s good news for President Donald Trump’s agenda, which promotes U.S. “energy dominance.” Trump touted the impacts of his regulatory rollbacks in his first State of the Union address Tuesday night. Indeed, the Trump administration has rolled back regulations on energy production and offered up more parcels for drilling. However, almost all of the oil production gains came from hydraulic fracturing operations on private and state lands. In just a few years, the U.S. is now poised to overtake Saudi Arabia as the world’s second-largest oil producer. Analysts project that U.S. oil production could top 11 million barrels per day next year. Saudi production currently sits at 10.6 million barrels per day. “The U.S. could add upwards of 2 million barrels a day from where we are today by the end of 2019,” Yergin said.